Experts recommend that adults try to get 30 grams of protein with every meal. 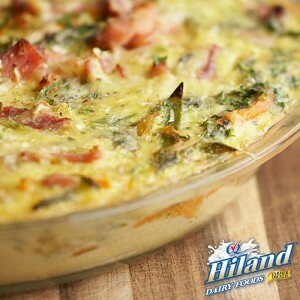 But getting to that magic number 30 can seem daunting…until you realize that in many cases, all you need to do is ‘Just Add Hiland.’ Meaning a glass of Hiland Dairy Milk here or a scoop of Hiland Dairy Cottage Cheese there can pump up the protein in a way that’s not only nutritious, but delicious too! In fact, why not check out this tasty recipe that packs in over 33 grams of protein when you serve it with an 8 ounce glass of Hiland Dairy Milk. This mouth-watering breakfast pie is perfect for weekend mornings to get the gang out of bed and into the kitchen! Cook sausage in a large skillet over medium heat until no longer pink. Drain on paper towels. Combine 1 3/4 cups cheese and next 7 ingredients in a large bowl and fold in potatoes. Spread half into a greased shallow 3-quart baking dish. Top with sausage and remaining potato mixture. Sprinkle with remaining cheese, cover and bake in preheated oven at 350°F for 45 minutes. Uncover; bake 10 more minutes or until heated through.